When I first used Seagate’s Momentus XT drive about a year ago, I was floored by how fast it was. The hybrid drive gave you awesome speeds on commonly used applications and the storage space that allowed you to keep plenty of files on hand. You couldn’t find a solid state drive with the same amount of space at any affordable price. Seagate’s now releasing their next generation Momentus XT drives and they’re looking to improve on an already impressive product. If you don’t know anything about the Momentus XT line, it’s a hybrid hard drive which has the traditional platters for large amount of storage and some NAND flash space to store commonly used applications and boot files. When accessing things you do a lot during your time on the computer, the Momentus XT will store these files on the NAND area for quick access. That means it’s like accessing files on a solid state drive, and you know how quick that can be. The inclusion of traditional platters allows Seagate to offer plenty of space without making it hella expensive, like a large SSD drive. So, what Seagate’s releasing this year is a 750GB version featuring 8GB of NAND flash space. That’s an increase of 250GB of storage space and 4GB of NAND space over the previous Momentus XT drive. It’s still a 2.5” drive so it’ll fit nicely in a laptop or a desktop with some brackets and the drive speed still sits at 7200RPM. Now, should the NAND part ever fail, you’ll still have a perfectly functional 750GB 7200RPM hard drive. So those that wonder if this drive would be rendered useless should there be a failure in the NAND part, you can still use it fine, but without the speed benefits. To see how well the drive did, I compared it to a Crucial m4 128GB SSD that I had. The Crucial SSD at only 128GB capacity was less than in price than the 750GB Momentus XT. Still, it’s not too much more expensive and you get a ton more storage space. But we’ll get to pricing a little bit later. For boot times, I started timing when the POST screen disappeared to see seeing a cursor on screen. As you can see, the Momentus XT came in very close to the boot time of the Crucial SSD. At a few seconds behind, the Momentus XT really showed that it can hang with the SSD in providing a quick boot from being powered off. Since I work with a few applications, I decided to see how well they do. Adobe Photoshop CS4 was used to and timed from when I clicked on the icon to when the program loaded with a blank canvas. 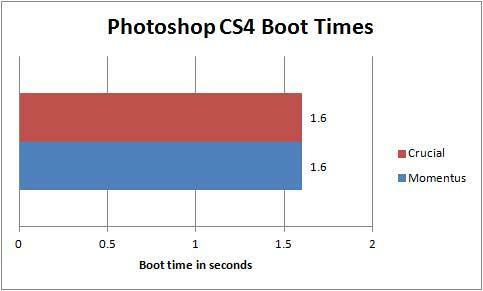 Neck and neck with the Crucial SSD, the Momentus XT sure did fire up Photoshop in no time. I’ve sat through a lot longer boot times with my regular 7200RPM Seagate hard drive and it was great to be up and running in 1.6 seconds. Visual Studio 2010 is notorious for taking a long time to load. In fact, I’ve had times where I would start Visual Studio 2010 on my work laptop and just walk away for a few minutes because I knew my computer wouldn’t be ready for a while. 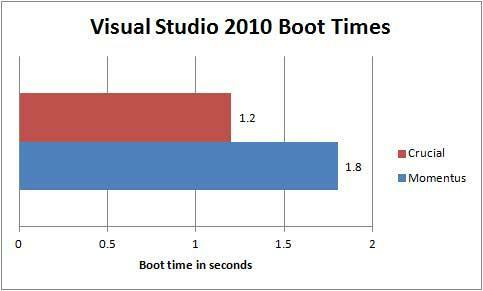 At 1.8 seconds, the speed at which I was ready to program with Visual Studio 2010 was astonishing to me. 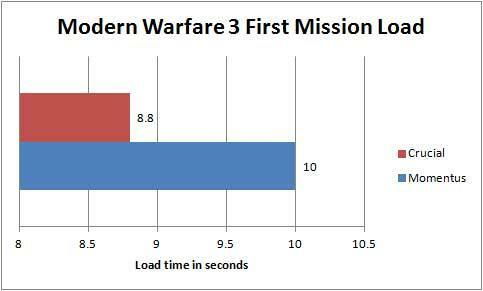 It didn’t beat the SSD, but it’s hard press to complain when it loads in under 2 seconds. Let’s try a few games. Two of the game I’ve been playing the most recently were tested here. First, the older but still awesome Left 4 Dead 2 was used. 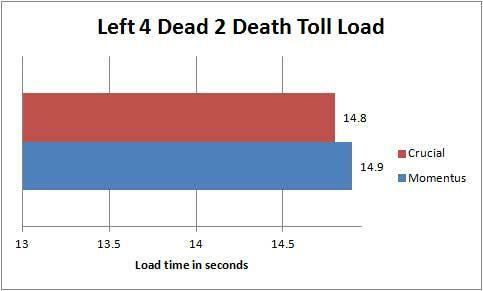 I tested loading the beginning of the single player campaign for Death Toll, which was added to L4D2 in a patch a while ago. The Momentus XT kept up in line with the SSD as it went from start to the beginning of the campaign in less then 15 seconds. Great speeds since I’m used to taking much longer to start a Left 4 Dead 2 map. The next two tests feature Call of Duty: Modern Warfare 3. First off, let’s see how fast it takes to go from the desktop to the menu. 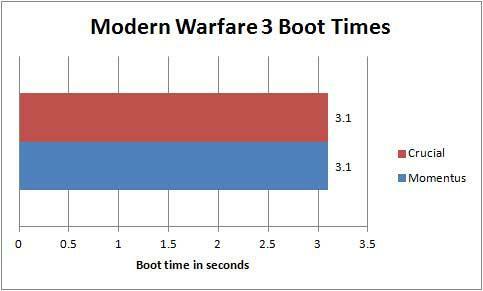 3.1 seconds for both so the Momentus XT kept up with the SSD just fine here again. Now, I timed it from selecting a new single player campaign to when I could begin playing. Here you see the Momentus XT being beat by 1.2 seconds from the menu to start, but it’s still pretty damn fast at 10 seconds. 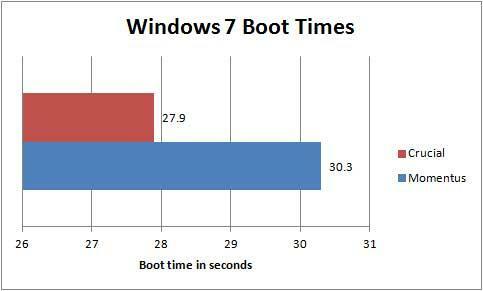 I don’t think anyone’s going to complain about waiting an extra second or so compared to the SSD. As you can see, for games or applications that you’re going to use often, the second generation Momentus XT provides a great performance boost for loading. The 8GB of NAND flash doubles the amount that the hard drive can cache over the previous version and you get a good amount of space at 750GB of storage capacity. Because of the recent issues with Thailand, hard drive prices have been on the rise and the Momentus XT is no exception. The original price was really, really competitive, but the current price of $245 still isn’t too bad for what you get. I currently use the 500GB in my laptop and one of my Windows 7 Media Center machines and it gives me the best of both worlds in terms of performance and storage. The extra cache and space is a nice improvement over the older drive, but the price is a little steep. Hopefully, when the hard drive situation stabilizes, we’ll see this drive go back to the original MSRP, which was what I expected. The Momentus XT 750GB hard drive is a nice option to have for those that don’t want to go full SSD or lack the space to do a combo SSD and regular hard drive option. I never experienced reliability issues with the previous generation of drives, but I’ve heard Seagate’s taken care of any past issues so I’m guessing the new drive should be solid as well. With almost SSD like speeds for your most used applications and 750GB of space, the second generation Momentus XT drive is a great storage option for laptops and desktops. At $249, the price for the Momentus XT is a little bit high, but that's because of circumstances beyond their control. Still, the drive offers speeds close to an SSD and the space for plenty of games and files.